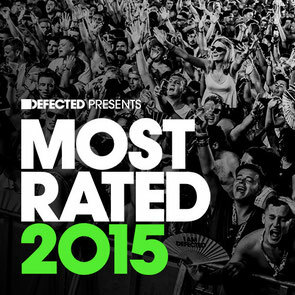 ‘Defected presents Most Rated 2015’ brings you some of the biggest tracks of the year, unmixed and unadulterated, including cuts from Hercules & Love Affair, Claude VonStroke, Hot Natured and The Magician. As you’ll know, the Most Rated series is all about bringing you the tracks you’ve probably been hearing on dancefloors and radio stations around the world. With 2014 being another big year for house music, this latest instalment is packed with a tracklist from well-established artists and prominent newcomers alike across a multitude of labels including Hot Creations, dirtybird and of course Defected. It features tracks from some of the biggest names in house music, including Groove Armada’s ‘Highway 101’ and a new version of a longtime Defected favourite, Bob Sinclar’s ‘Save Our Soul (Brian Tappert Re-edit)’. Also included are Hot Since 82’s ‘Pound Your Soul (Sidney Charles Remix)’ and ‘Forget’ from Patrick Topping, possibly one of the biggest tracks from Ibiza this year. It’s out 23 November on Defected Records.